We are Open for Business and are Better than Ever !!! Elegance is the hallmark of this beautiful Italianate-style home. 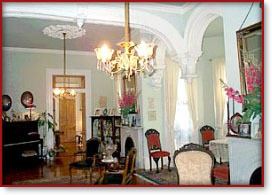 Ceiling medallions adorn the foyer, dining room, parlor and solarium, while the main focal point of the bed and breakfast's interior is the convergence of three separate archways, which extend over the double-parlor and solarium. The union of these arches reaches toward the floor and is suspended effortlessly in mid-air -- the perfect setting for your wedding ceremony or the renewal of your marriage vows! 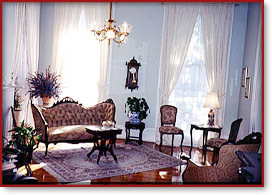 The parlor and solarium are elegantly appointed with antique Victorian furnishings as well as a 1912 player piano. 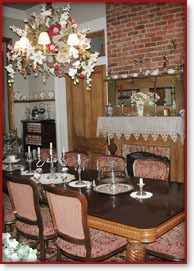 The dining room features an 11-foot oak table which provides a casually elegant setting for breakfast. Eleven fireplaces grace the home, including two in the double-parlor, which features Italian marble mantelpieces. Unique cypress mantels add their own distinctive flavor to each guest room's ambiance. Original cypress millwork and transoms exist throughout the home. Most bathrooms feature vintage clawfoot tubs and showers. The lush tropical garden of this B & B has been transformed since Hurricane Katrina to include a new in-ground swimming pool and hot tub. The area still provides a great setting for sipping your morning coffee, reading your favorite novel, having an afternoon cocktail or sharing a late-night talk with your sweetie after a long day in New Orleans. The base of the home's original cistern still provides a home for our Rebecca fountain and goldfish, while other ponds and fountains adorn the garden.